A wooden pull-along alligator with a spikey back and toothy-peg jaws chomps along the floor; a leggy, articulated puppet with fiendish face dares, “jiggle my strings”; there’s a train, a tree and a block jigsaw, and a set of holey Humdingers. What were once much played with toys, designed and built by artists, have been retrieved from their storage box in the boiler room of the Sarjeant Gallery Te Whare o Rehua Whanganui. Two of the toys, the alligator and the puppet, are on display in the exhibition Revealed – Collection discoveries from our recent move, at the Sarjeant on the Quay. In the 1980s when children visited the Sarjeant they would make a beeline for the Gallery’s box of wooden toys. Bill Milbank, former director of the Gallery, remembers it well – he put it together. 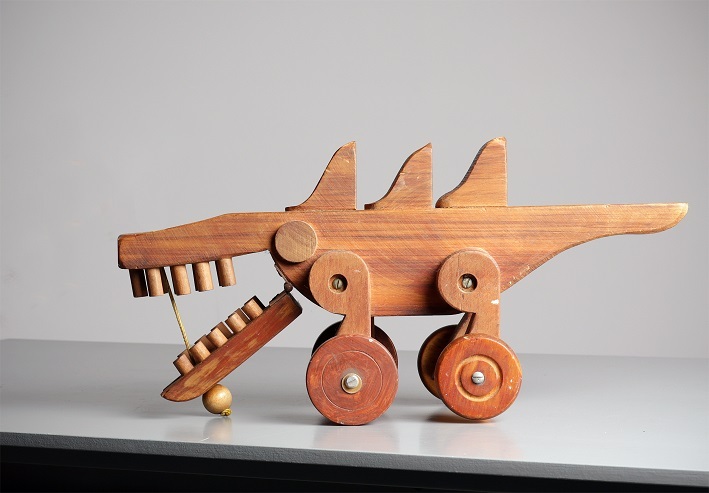 In 1977 Mr Milbank sourced wooden toys from around New Zealand for an exhibition. “The idea was that the toys were made by artists and high end crafts people, as opposed to more commercial toys. It was cheaper for me to buy some of the toys for the exhibition rather than freighting them around. It was also a way of supporting crafts people who are living on the edge,” Mr Milbank says. In the 1980s Mr Milbank worked on another toy-based show with photographer and designer Robin White. “We had a machine blowing air through yellow plastic tubes like bright, colourful snakes and these things were flying all around in the back gallery. There were dozens of Humdinger sets and people could come in and construct large structures.” The Humdinger set has 100 wooden components including freeform shapes, rods, threaders, wheels, square and triangular shaped pegboards, primary coloured plastic balls and storage. Mr White developed the Humdinger design and production machinery and, with family Mere, their three daughters and local subcontractors, made Humdinger sets full time for 20 years, initially at their workshop in Mangamahu then later in Auckland. A Humdinger set was gifted to the Sarjeant following the highly successful exhibition and became part of the toy box.